Offers > Crowdtap > Learn Why Influencer Marketing Isn't About the "Influencers"
Crowdtap, the leader in peer influence, has published a new report that focuses on the hot influencer marketing space, revealing how marketers can build advocacy and drive purchasing behaviors. Despite its popularity within the industry, definitions of "influence" and the discipline of "influencer marketing" greatly vary. To date, efforts around influencer marketing have focused on developing algorithms that attempt to apply a score to identify individuals with mass reach on social networks like Facebook and Twitter. For the most part, this methodology is simply an evolution of traditional online advertising, paying for eyeballs or impressions. As discussed by Crowdtap CEO and Founder Brandon Evans in the Advertising Age article, Why Influencer Marketing Isn't About the 'Influencers' the key for marketers is to focus on scaling their marketing efforts, by identifying influencers who drive purchasing decisions through tight-knit groups of friends, family, and peers. 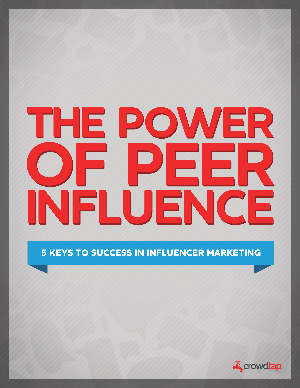 Due to the popularity of the article and the ripple it caused throughout the marketing and advertising industry, the report The Power of Peer Influence: 5 Keys to Success In Influencer Marketing was born.